Description of "C/C++ Software Development with Eclipse (Print)"
Eclipse has always been a great choice for an IDE. C/C++ Development Tooling for Eclipse has also matured enough to be at the centre for C/C++ Development. 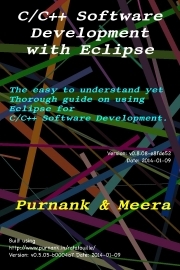 This book takes a whole new practical approach on Learning Eclipse. It follows the learning path very close to ideal Software development (maintenance) life cycle. [[Purnank]] Purnank was first introduced to Eclipse based IDE in 2003 with IBM® Websphere™. The early fascination and a gradual influence of a plethora of Eclipse based plugins convinced him more than a Swiss knife for software is finally available. With ever increasing functionality of C/C++ Development Tooling within Eclipse, he thought it is the right time to introduce a majority of C/C++ developers what they are missing and started working on this book with his wife, Meera. Reviews of "C/C++ Software Development with Eclipse (Print)"